BBC news correspondent Rageh Omaar, who broadcast daily from the Iraqi capital Baghdad during the recent war, has signed a book deal. Mr Omaar, who was also previously the BBC's Africa correspondent, will write two books, the first of which will come out in 2004. A Viking spokeswoman said on Monday newspaper reports that Mr Omaar was to receive £1m for the two books were "exaggerated". She refused to disclose how much the deal was worth. "The first book, entitled Revolution Day will be Rageh Omaar's story of the recent Iraq war. "During that conflict millions of people turned to Omaar for the quality of his reports from Baghdad," said Mary Mount, editorial director of Viking Books. "This will be the most important book to come out of the conflict," she said. Mr Omaar's second book will be about Somalia, where he was born, and "will be a very personal book bringing together stories of exile, war, tradition and his own family", Ms Mount said. 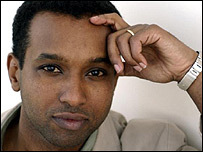 Mr Omaar, 35, was born in Mogadishu, Somalia, but educated in England, including Oxford University. He joined the BBC in 1992, working as a journalist for the World Service before becoming the BBC's correspondent in Amman, Jordan in 1997. As Africa correspondent he covered stories such as the drought in Ethiopia and floods in Mozambique. During this year's war in Iraq, Mr Omaar covered reports including the arrival of US combat troops in the Iraqi capital. His BBC reports have also made him a big star in the US.